Racers notes and some things of interest regarding the upcoming Bedford racing season which kicks off officially on Friday April 5th with our 83rd Anniversary Opening Day. 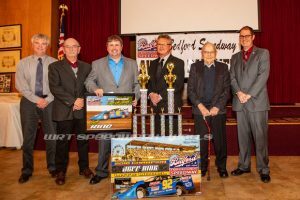 Nearly 300 Bedford Speedway drivers, crew members and fans gathered inside the Bedford Elks Ballroom on Friday evening January 25th to bring an official close to the 2018 racing season with the annual Bedford Awards Banquet. Honored at the banquet were the top ten point finishers in the Late Models, Late Model Sportsman, Semi Late, Modified, Pure Stock and Four Cylinder divisions. 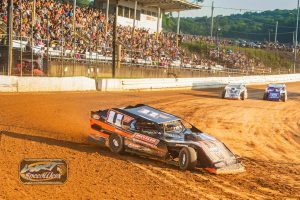 Renegades of Dirt Set For Inaugural Stop At Bedford Speedway In 2019! The Renegades of Dirt Modified Tour which returns to high profile national touring status in 2019 is excited to announce the addition of Bedford Speedway to its upcoming schedule of events. One of the nation’s premier names in modified racing, the ‘Renegades’ will make its first ever visit to the Bedford Fairgrounds Speedway on Friday May 17th for a stellar $2000 to win Modified special. With the 2018 Bedford Speedway racing season in the books, work has begun preparing for the 2019 season. We would like to take this opportunity to thank everyone who supported racing at the Bedford Speedway this year. The positive response from racers and fans throughout the season has been absolutely amazing, and it is very much appreciated. We would also like to send a special thank you to the Bedford County Agricultural Society for providing us with a fantastic facility to race at. While weather was a constant problem this year, the speedway was still able to complete 20 shows this season. Moving forward to next year, many plans are in the works to continue to provide our fans and racers with a fantastic racing experience. Tickets are currently on sale for the Annual Bedford Awards Banquet. The banquet will be held on Friday night, January 25th, 2019 at the Bedford Elks Ballroom. Awards will be distributed to the top ten in points in the Late Models, LM Sportsman, Semi Lates, Modifieds, Pure Stocks and Four Cylinders. Tickets are $37.00 per person and must be ordered from the speedway office in advance, the banquet is always a sellout and no tickets are sold at the door. The 2019 racing season will begin with Opening Night on Friday April 5th, 2019! Until then keep an eye on this website for updates!